Most people with jobs have a pretty stable income. However, some people, like car salespeople and freelancers, don’t have the luxury of having a reliable paycheck every two weeks. Budgeting, saving and investing on an irregular income can be a huge challenge whether you work on commission, on a freelance basis or some other variable income basis. My big burning question is what do you do if you don’t get a regular paycheck, but want to start saving and investing. I am a freelance contractor and I have good months and bad months. It’s hard for me to know how much money I’m going to make, which makes it hard to budget. Do you have any strategies for me? I’m happy to say that I do have a great strategy for them and everyone else who has an irregular income. So, let’s get started. The first thing I’d mention is you should have a cash buffer on top of an emergency fund. This cash buffer could be any amount you choose, but in an ideal world, I’d have mine be one month of my typical income. Keep in mind, this is above and beyond whatever emergency fund you’ve decided on. Typically, your emergency fund should range anywhere from 3 to 12 months of expenses. I keep mine in a high yield online savings account. If you don’t have an emergency fund yet, you can start a small $1,000 emergency fund in 90 days or less before moving on to a full emergency fund. But why should you have a cash buffer in addition to your emergency fund? The buffer allows you to live this month on last month’s income. This way, you’ll never have a surprise when your income comes in less than you’ve budgeted to spend. After all, spending more than you earn can lead to nasty credit card debt. Since you’re living a month ahead thanks to your cash buffer, you’ll be saving this month’s income to spend next month. To budget for the future, simply sit down at the end of the month and figure out how much income you’ve made this month. Then make next month’s budget based off of this month’s income. This budgeting trick will give you the certainty to be able to budget the exact amount of money you’ll have available for spending, saving and investing. In order to enact the above advice, you really need to know how much your average income and expenses are each month. If you’re not tracking your spending and income, then there is no way you can accurately create your one month cash buffer. You could take a guess, but then you may be left with an overdrawn checking account in a bad month. Overdraft fees are no fun and a huge waste of money, so don’t let this happen to you. Tracking your expenses and income can be much easier than it’s made out to be. You can link your accounts in software like Personal Capital that will aggregate all of your transactions in one place or you could simply write down every transaction on a piece of paper on your refrigerator. Once you begin tracking your spending and income, you can identify patterns and learn how much you earn and spend in an average month. Empowered with the knowledge of what an average month looks like, you can figure out how much money you should be earning each month to cover your monthly spending. Add in how much you want to save and invest each month and you’ll have a target income goal for a baseline or average month. What Happens If I Have An Awful Or Amazing Month? It’s not uncommon to have both amazing and awful months when you work on commission or have another source of irregular income. But what should you do when that happens? Most people spend the extra income in the great months and regret it when a hard month comes. Don’t do that. Instead of buying a brand new big screen TV, squirrel away the extra money from the good months so you can supplement your income in the not so good months. If you notice your cash balance keeps growing from having more awesome months than bad months, then you can adjust your budget to allow yourself to spend, save or invest more money each month. I normally suggest that people automate their savings and investing. This allows you to pay yourself first without having to think about it and increasing your success rate. Automation doesn’t work as well with an irregular income, though, because you might accidentally overdraw your account in a bad month. Instead of automating your investments and savings, you’re going to have to take a more proactive approach to saving and investing when you have an irregular income. There are a few ways you can remember to save and invest, but I’ve listed my favorites below. There are other ways you can remind yourself to save and invest regularly. The key is finding a method that works for you and sticking to it. Saving and investing can be difficult but it is well worth it when you finally have enough money to make that large purchase or you reach the day you can finally retire. Now that I no longer have a day job and work as a freelancer, I don’t have a fairly regular income, either. I enacted my plan of the one month cash buffer on top of an emergency fund and it has worked wonders so far. If things ever get bad, I could dip into my emergency fund. However, I personally prefer to have the small cash buffer to normalize my income for the occasional bad month. How do you budget, save and invest with an irregular income? Do you like the method described above or do you prefer a different method? I’d love to hear your thoughts. P.S. Today’s post was inspired by a reader’s question. If you have a question for me, please contact me! I love helping you out and chances are many people have the same question you do! So, what are you waiting for? Email me! P.P.S. Could you do me a huge favor and pin the image below to Pinterest? It’s a great way to bookmark this post for later and help me out! 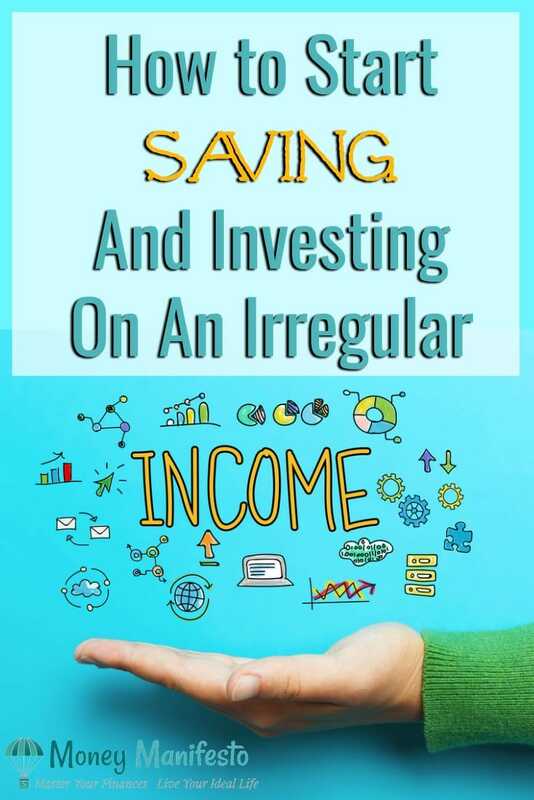 The post How To Start Saving And Investing On An Irregular Income appeared first on Money Manifesto.